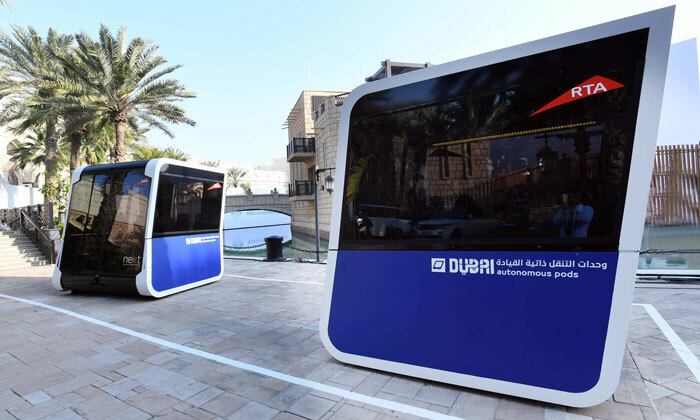 The Roads and Transport Authority (RTA), as part of the Dubai Future Accelerators initiative, has begun testing the world’s first autonomous pods. Each pod measures 2.87m in length, 2.24m in width and 2.82m in height. With a weight of approximately 1500kg, each pod has an average speed of 20km/h and a capacity of 10 riders: six seated, four standing. The autonomous pod is fuelled by a battery that can supply three hours of operation and is chargeable in six hours. The autonomous pods are designed to travel short and medium distances in dedicated lanes. Depending on the destination of the riders, they can be coupled in 15 to 20 seconds or detached in five. Fitted with cameras and electromechanical technologies enabling the pods to couple and detach, the feature can be activated in-motion. “The pilot test of driverless units is directed in the context of transforming Dubai into the smartest city worldwide,” continued Tayer. “It is also part of RTA endeavours to provide autonomous transport through technological tests under Dubai’s climatic conditions. It echoes the Dubai Autonomous Transport Strategy aimed at converting 25 per cent of mobility journeys in Dubai to autonomous transportation by 2030. This entry was posted in Autonomous Vehicles and tagged Autonomous pods, autonomous transport, driverless pods, Dubai future accelerators, Dubai RTA, Intelligent Transport on February 16, 2018 by Tim Cosgrove.